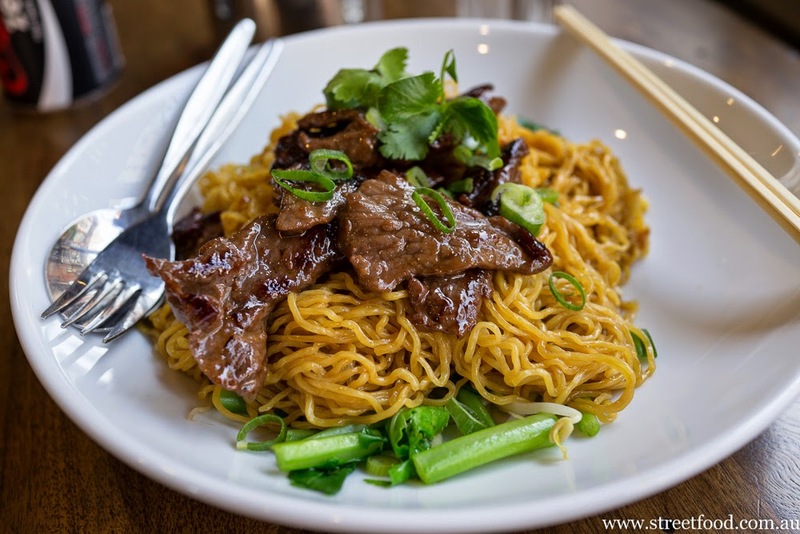 The top of George Street in Haymarket is becoming a halal hotspot, with excellent North Chinese handmade noodle joints, the recently opened India Gate, as well as It's Time for Thai, the subject of this month's eating obsession. 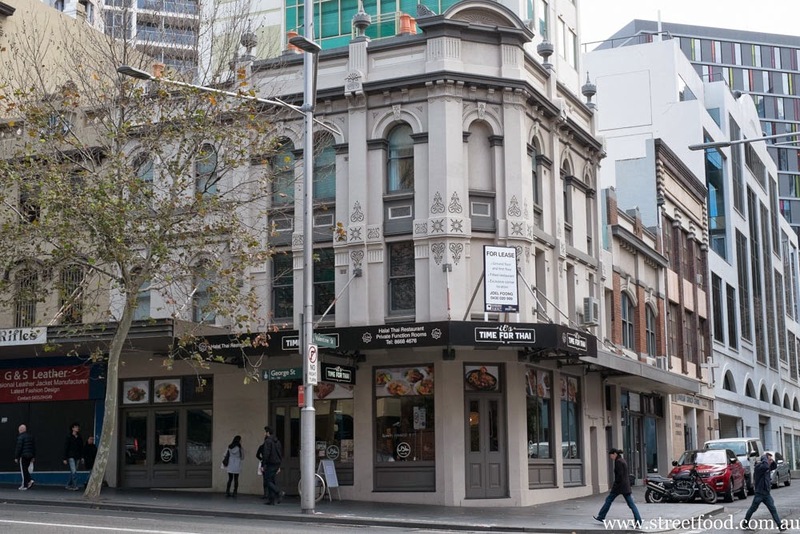 It's time for Thai recently replaced Cafe Kasturi, how we miss their glorious ayam rendang. We were sad to see the unique Cafe Kasturi replaced with yet-another-Thai joint. That is until we saw the halal menu bulging with goodies beyond the usual red curry and pad Thai. 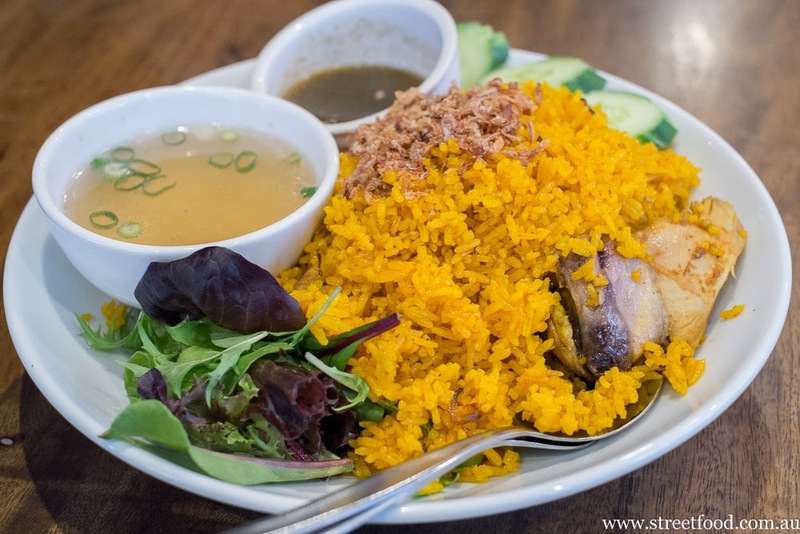 We've been exploring the excellent $10 lunch menu (not just because we're cheap, which we are, but the lunch time has better light for photos), which has a range of 'with rice' dishes, roti, soups and noodles. We can see this place being a welcome one on our revisit roster, of course after we've visited all the other new Thai joints that have been popping up in the area. Chicken soup - $10. Like those chicken noodle soup you get on the side of the road in Thailand, only bigger. 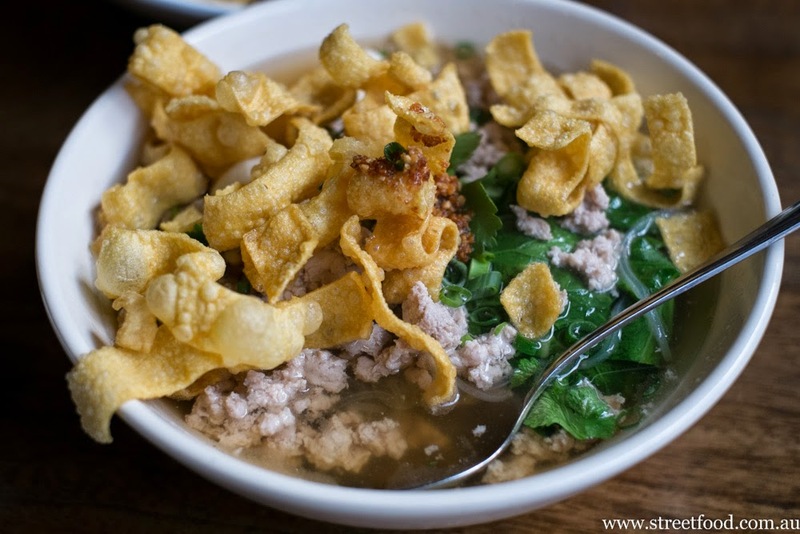 Clear noodles, minced chook and a couple of fish balls in thin broth that's not too sweet or salty, it's just right. On another day the chicken soup came with crunchy fried goodies on top. 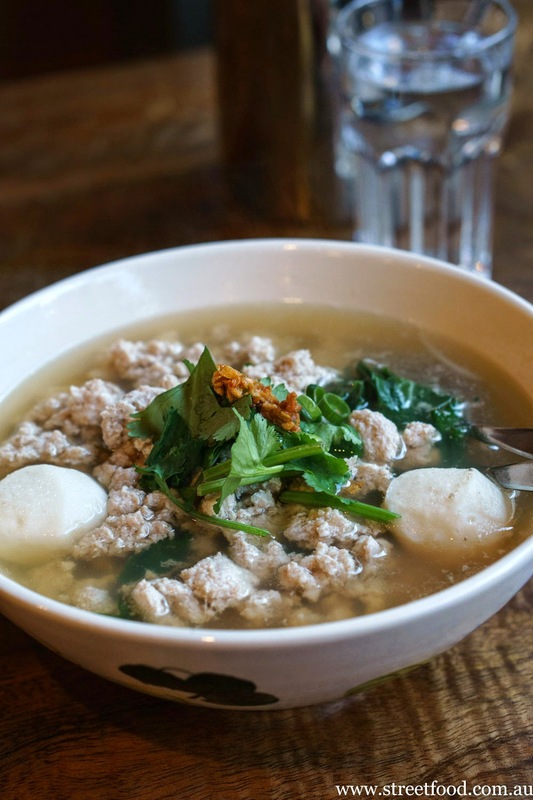 This style of soup ranks high on our list of comfort food options, a great broth that can clear any ills and a good protein burst that fills the belly. Five spice chicken soup. 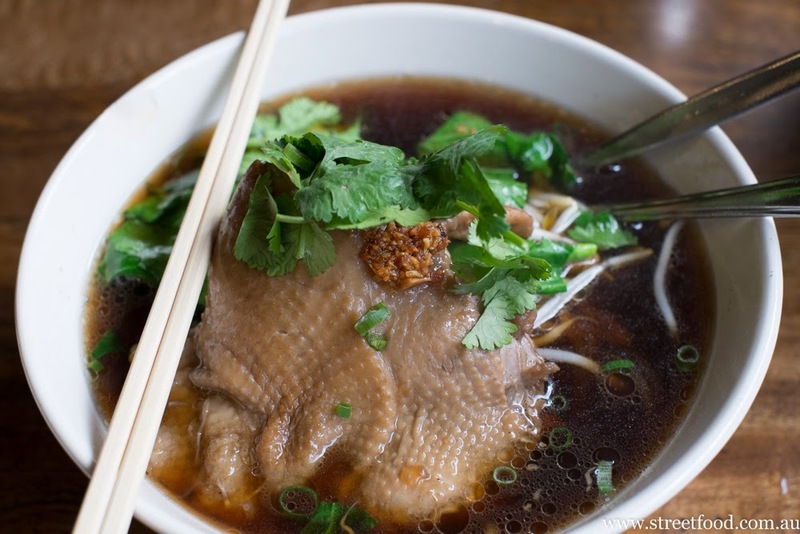 A generous hunk of chook swimming in a sweet dark broth with lovely strong five spice flavours. Leaving the skin on adds in some welcome fatty flavour to the meat. 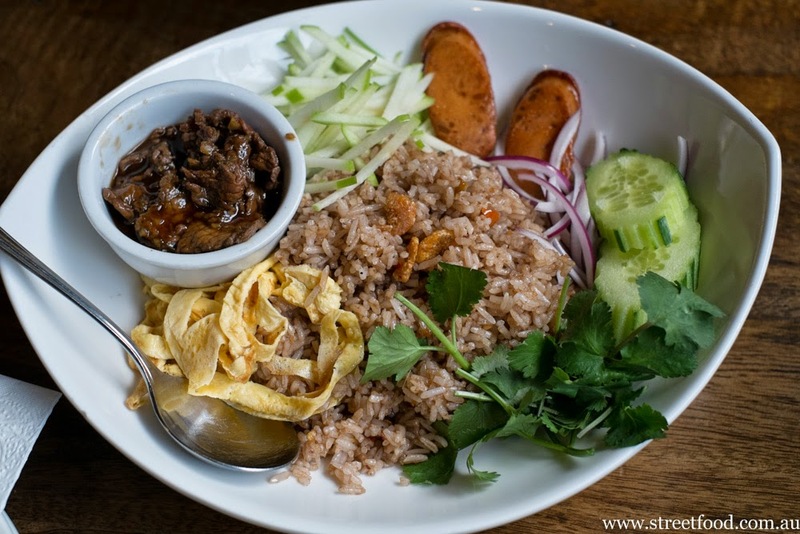 Khao klouk kapi - rice mixed with shrimp paste. This is another 'wow' dish. Fried rice given a salty kick from the shrimp paste, served with grated apple (perhaps a green papaya substitute when not so easily found), ribbons of omlette and a couple of slices of sausage that have been sliced and lightly fried. We can't remember what was in the little round dish except it was beefy and delicious, we'll just call it a bowl of beefy deliciousness. BBQ Chicken & rice - $10. A generous hunk of protein reminiscent of Aussie BBQ chook, with some sweet chili dunky sauce on the side. 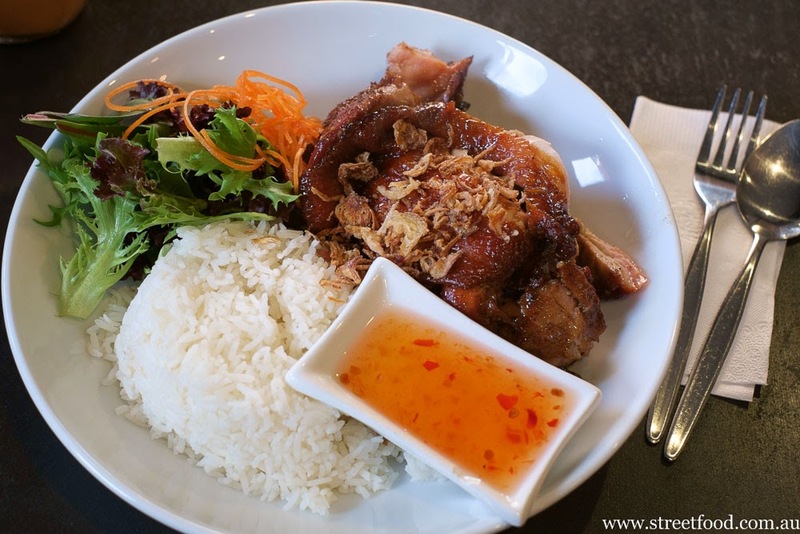 Mr Shawn loves chicken rice in all it's forms, this one is filling and highly recommended. Khao mok gai. A hunk of poached chicken under a mound of yellow saffron rice. It's kind of like a biryani with short grain rice, the dry fried shallots give it a lovely crunchy texture. It comes with soup on the side and minty dressing for the chook. Quite filling and highly recommended. BBQ with savoury sauce - ($10 during lunch) - beef strips in a sweet sauce, the sauce has Chinese sweetness with a tangy Thai funky punch, it works well. The sauce on the side is soy with chopped chili, not as bitey as it looks. The chilli actually works to cut down some of the sweetness of the sauce and make it more balanced, don't fear using a generous amount. Egg noodles with bbq beef ($10) - during lunch. Wethinks this is a Halal version of that Southeast Asian classic of pork and egg noodles. The beef seems lightly cured, it's a bit like bacon, a little sweet on the outside like bbq pork, and a lot delicious. The egg noodles have been coated in a little sauce and maybe some oil or fat giving it a touch of umame. Roti with red (or green curry) - $10 during lunch. The roti seems house made and has a nice light crunch to the outside, it's pretty good. And red curry is always good. Roti dunked in red curry is even better. 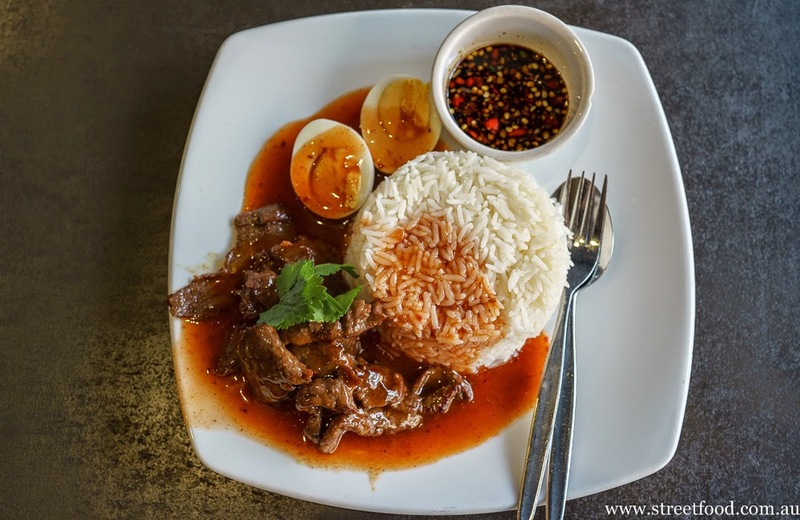 Some might wonder why roti is in a Thai restaurant, but food and flavours dance around the borders and boundaries in South East Asia. 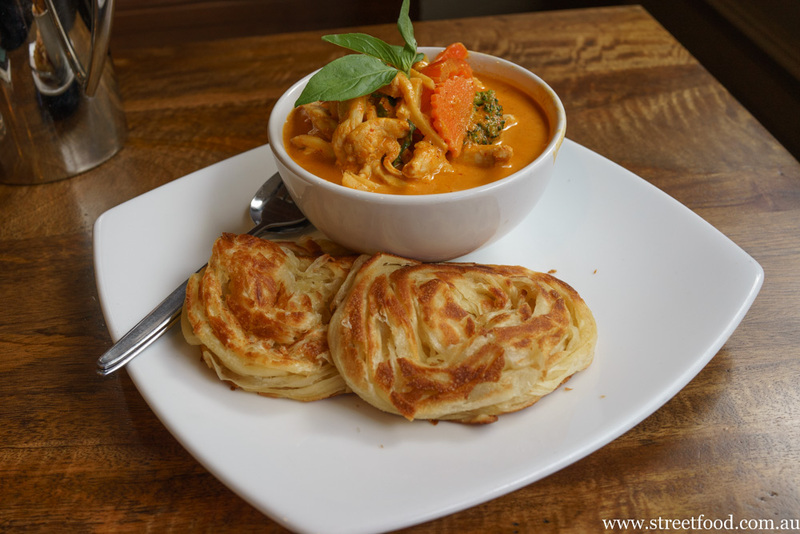 Roti is quite popular in Thailand, just like tom yum can be found throughout Malaysia. 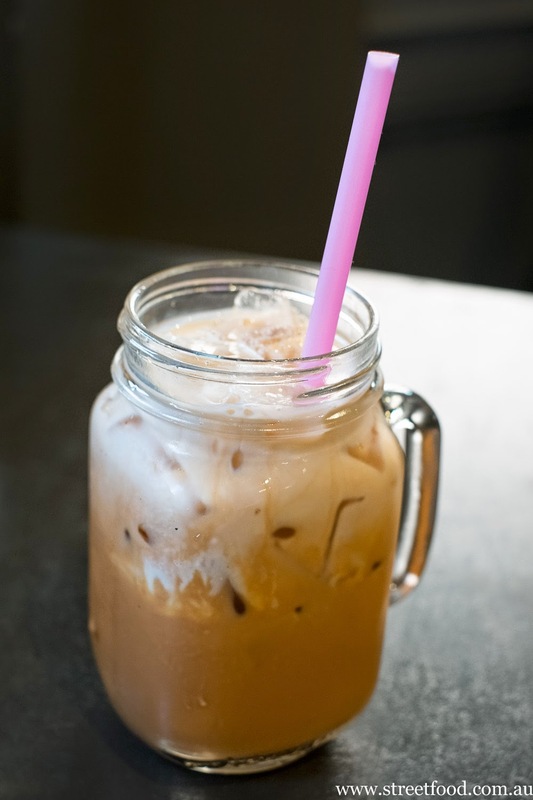 The $10 lunch deals also include a free can of soft drink, or add $1.50 for Thai ice milk tea which is rich and sweet, it tastes like a glass of chilled red velvet cake, highly recommended. 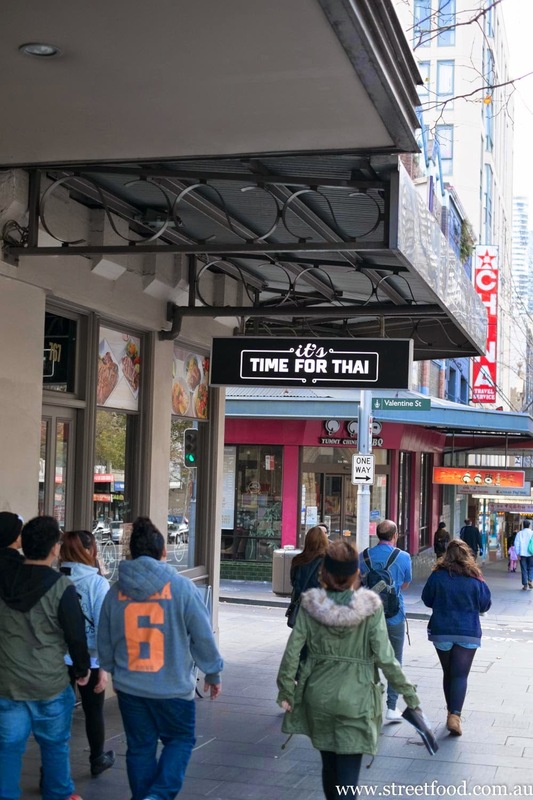 It's Time for Thai is at 767 George Street Sydney. They have a store on Anzac Parade in Kingsford as well. I almost forgot about tom yum being widely available in Malaysia! Went I went to Malaysia in 2004 (a decade?!?! ), nearly everything I ordered was tom yum. Great food memory from that trip was a tom yum chicken claypot rice! Shame I wasn't into taking food photos back then. Green papaya is not easily found in Sydney? Really??? Perhaps we meant more that it can be expensive at certain times of the year, so apple is a cheaper and easier to find substitute.